I hope that 2008 was a good year for you and that 2009 brings with it the joy and happiness we all strive for in our lives. Here is a list of some of my favorite sweet recipes I think you need to make this year and why. I can’t wait to begin baking in 2009! I am interested in hearing from you! Which recipes from my site have you tried and what have you thought about them? WHY: A family favorite for years that is sure to please. I love the subtle chocolate flavor the brownie has, making it the perfect base for marshmallow and chocolate frosting layers. Trust me, if you like chocolate, these bars will be sure to please. WHY: So simple, so easy, so quick, so good. With endless varieties (check out my ‘blondie’ category) these are the perfect dessert. You can really take the base recipe and make them your own, I can’t wait to try more combinations of add-ins this year! WHY: Usually I am not a fan of chocolate cookies but these grabbed my tastebuds and my heart. So rich and full of possibilities. I have added chopped PB cups, white chocolate, nuts etc. to them and they have turned out rich and fabulous every time. Don’t trust me? How about Anna? WHY? These bars are so gooey with layers of chocolate and caramel sandwiched between an oatmeal base and topping. I have been making this recipe for years and years. It has always been one of my favorite dessert recipes. WHY: These are the best PB cookies I have had. They are soft, chewy, peanut buttery and I love that they have PB and Chocolate chips in them. The roll in sugar before baking really takes them over the top. WHY: These are perfect for the holiday season with their flavor combination of ginger and cinnamon. I absolutely loved these cookies, they remained chewy for days and the little bursts of cinnamon chips through out the cookie made these stand out from the ordinary ginger cookie. WHY? These don’t require baking, making them perfect for days when you don’t want to use the oven. Their combination of peanut butter, chocolate and oatmeal is one of my all time favorites, a sure winner! WHY: If the title alone doesn’t tell you, I am not sure what else to say. These have been requested by my friends and co-workers alike. The best part is they are so simple to make, require few ingredients yet can be ‘dressed’ up to look like a fancy dessert if needed. WHY: These have turned out to be one of my all time favorite cookies ever. I am in LOVE the flavor of these cookies. The dough can either be dropped and baked or formed into logs and frozen for slice and bake cookies later. I prefer the drop method but either way these did not last long. 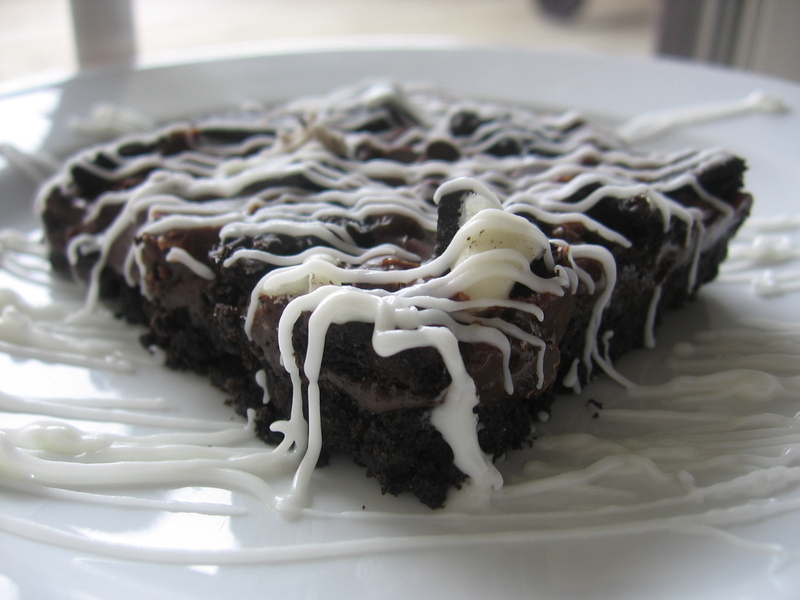 WHY: My all time favorite and most requested brownie recipe. If you are a fan of PB and chocolate, look no further than this recipe. Make them soon and make them often. These are worth cheating on your New Years resolution to diet. Trust me. Look at that picture, how can you resist? With all of the baking I do during the month of December, I love treats that require few ingredients, easy preperation and take minimal time from start to finish. Here is a no-bake treat that you are sure to love during this Holiday season. What better combination than Oreo cookies, peppermint and white chocolate? This treat is perfect with a cup of hot cocoa and will be a treat loved by children and adults! Prepare a 13 inch rimmed cookie sheet by lining with Reynolds Quick Release aluminum foil. Set aside. Melt the white chocolate chips, almond bark and Crisco in a heat safe bowl in the microwave in 30 second intervals. Stir after each interval and continue heating and stirring until smooth. Sprinke 1/4 cup of the Andes Peppermint chips and 5 Oreo cookies (broken) over half of the baking sheet. Gently pour the melted chocolate mixture o ver the Andes Peppermint chips and Oreos. Smooth with the back of a spoon (spray with PAM first). 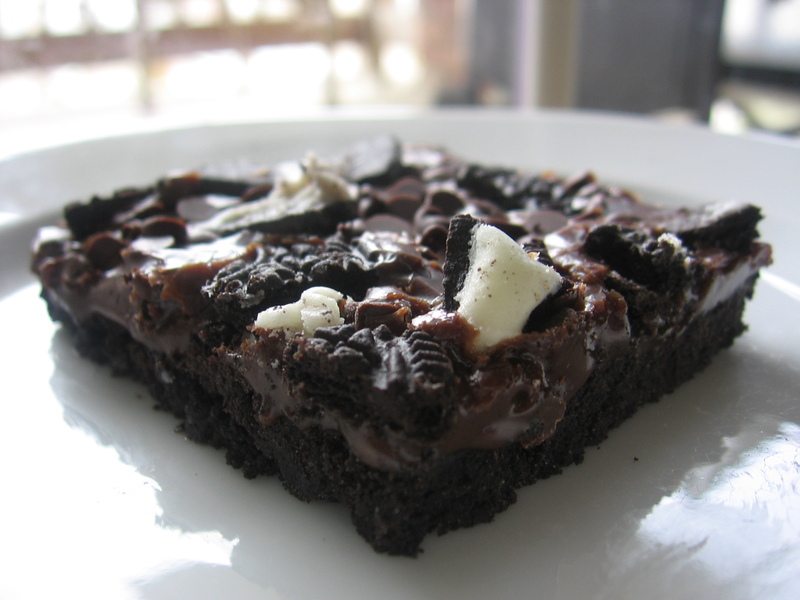 Evenly sprinkle the remaining Andes Peppermint chips and broken Oreos over the warm melted chocolate. Remove from freezer/fridge and break into pieces. Store in air tight container in a cool place. After a disappointing cookie recipe last week, I decided to hunt down a recipe that sounded like a winner. I found this recipe on allrecipes.com and tweaked it a bit based on my own preferences and the reviews of those who have made them. I changed the name of these bars to better reflect their goodness. These bars are rich, fudgey and full of Oreo goodness! Trust me when I say to cut these bars small as a little goes a long way! Despite being so rich and fudgey, they are not overly sweet in my opinion. Don’t get me wrong, they are definately sweet and will satisfy a craving in no time but not so much so that your teeth hurt just eating one. If you are not a chocolate lover (I know there are a few of you weirdos out there) do not make these as you will be highly disappointed! However, if you need an easy recipe that is rich and fudgey these are for you. These bars will be perfect for the holidays and I can’t wait t make them with the Winter Red Oreos or the Peppermint Oreos. I may substitue the Andes Peppermint baking chips on top instead of using the mini chocolate chips to enhance the Peppermint flavor for the holidays. The only downside is they will not ship well and should really be kept chilled until a few hours before serving. When serving for dessert I recommend cutting into squares and drizzling melted white chocolate over the bars, as I have done in the picture below. What a pretty presentation for such a simple recipe. MMMM good. Line a 9×13 pan with foil and lightly spray with PAM. Set aside 6 Oreo cookies for the toppings. In a small food processor grind the rest of the cookies. If you don’t have a food processor, just pound with a rolling pin until the cookies are fine crumbs. Add the salt to the crumbs and stir to combine. Melt butter and gently stir together with the cookie crumb mixutre. Press firmly into the bottom of the prepared pan. Coarsely chop the remaining cookies into chunks and set aside. Over a double boiler or in the microwave, melt 3/4 cup semi-sweet and 1/2 cup milk chocoalte chips together with the condensed milk and vanilla. Spread evenly over the prepared cookie crust. Sprinkle the mini chocolate chips and the Oreo cookies chunks over the top of the filling. Press down gently into the chocolate topping. Bake for 20-22 minutes oven. Allow to cool on counter for 1 hour. Chill in fridge until completely cold and set before cutting into bars or it will make a big mess. *These are not too great hot from the oven but are great after chilling and the filling has set!